What Does Dijon Mustard Taste Like? Know the Tasty Truth! →What Does Dijon Mustard Taste Like? Know the Tasty Truth! What does Dijon mustard taste like? You might be facing the same question but good to know there could be an answer to this query. Undeniably one of the oldest and most commonly used spices across the world, mustard has so many varieties you can find in the market. These include yellow mustard, honey mustard, spicy brown mustard, whole grain mustard, hot mustard, beer and spirit mustard, English mustard, German mustard, and Dijon mustard. Each offers a unique flavor to any food that is sure to melt event those rough palates. Today, we will focus on Dijon mustard – what it actually is, what kind of taste you can expect from it, how it differs from other varieties of mustard, and how to use it in cooking. Classic French mustard, Dijon mustard is initially made in Burgundy, France and is first exchanged in young grape juice for vinegar. It is now made with white wine. 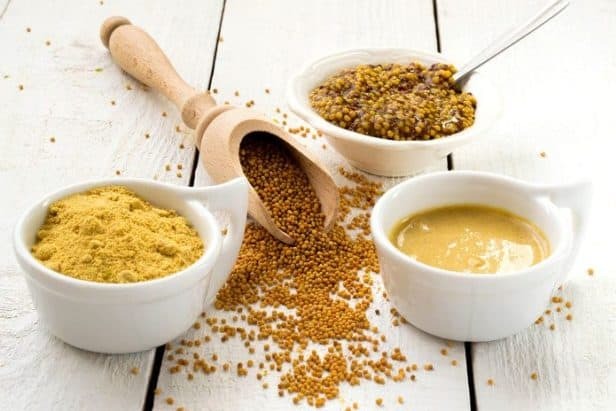 This type of mustard is usually made with black and brown seeds, juice of unripened grapes (known as verjuice), wine vinegar, white wine, seasonings or a mixture of all three. The seeds are ground and crushed and then filtered to get the crust out. It is then blended with verjuice or vinegar and water. Wine vinegar is widely used as it helps make the mustard quite strong, while verjuice offers a softer edge. Seasonings, like lavender, salt, tarragon, and summer savory, are added. For coloring, ground turmeric is also included. The color of Dijon mustard is pale tan to yellow, has a smooth texture as well as increased heat, more pungent flavor, and a robust profile. If you love potatoes or eggs, you will definitely appreciate the taste when you mix the Dijon, be that egg salad, deviled eggs, potato salad, or mashed potato. Even a simple sandwich can turn into a very delicious one with Dijon mustard. Love cheese dishes such as grilled cheese sandwich, mac, and cheese, or raclette? Let the Dijon give the best finishing note! When combined, melted butter and Dijon can make a tasty, simple sauce for roasted vegetables or fish. 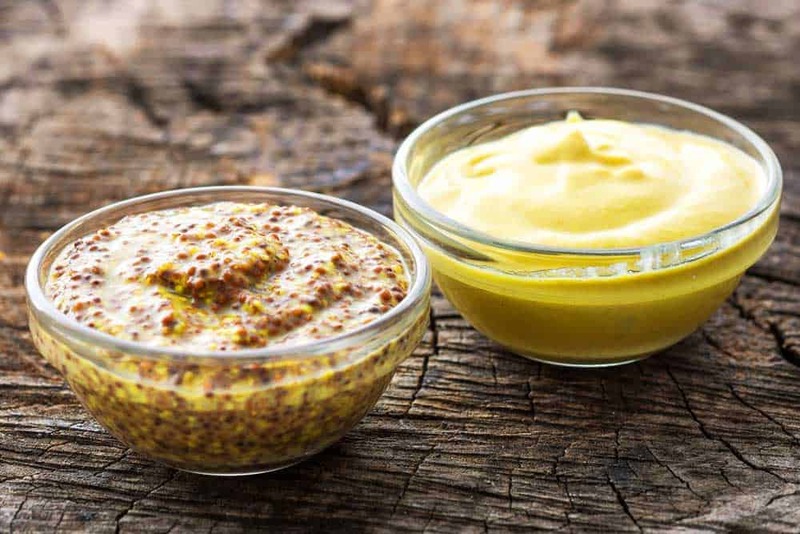 In addition to being a savory condiment for meats, sandwiches, and other foods, Dijon mustard is popularly used in gastronomy for elaborating common sauces or seasoning a dish. You may be wondering what sets Dijon mustard apart from brown and yellow mustard. Well, let's take a look at them. This one has a greater brown mustard seed concentration, which gives it a spicier flavor and darker brown color. Often used in Japanese, Indian, and Chinese cuisines, brown mustard gives a dominant flavor since it comes from a flowering plant similar to that of horseradish, wasabi, and arugula. Also called American mustard in other countries, this one is most popularly used in the US. It is a mild condiment with a bright yellow color, coming from the turmeric's inclusion. Yellow mustard consists of a plain 56 mg of sodium in every teaspoon serving, together with drop amounts of sugars, protein, fat, carbohydrates, and dietary fiber. This type of mustard is primarily for those who don't like the intensified sharpness and spiciness of Dijon mustard. This type of mustard is generally manufactured outside the French city of Dijon. A single teaspoon of it contains 120 mg sodium and five calories, which is much higher compared to yellow mustard. Apart from that, Dijon claims to have no health benefits at all since a typical serving has no vitamins or irons. Though some brands contain a minimal amount of potassium, it is not enough to offset the harmful influence of the sodium content and calories. Honey mustard, for instance, blends its two ingredients in balance volume to produce a sweet flavor. German or Bavarian sweet mustard, on the other hand, has applesauce, sugar, or honey. 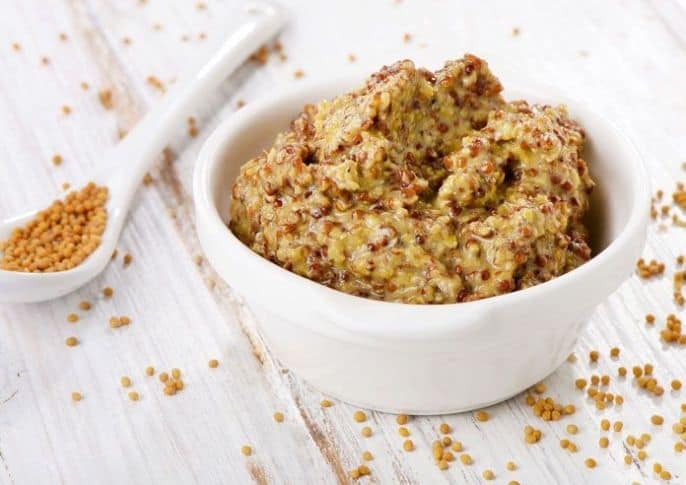 Frequently coarsely ground, the Deli mustard is commonly spiced with horseradish and powdered hot chile for a more pungent flavor. So, What Does Dijon Mustard Taste Like? Most Dijon mustard is a milky mixture of onion, garlic, salt, white wine, mustard powder, and a touch of honey. Because it is made with white wine, it lacks the nearly severe vinegar background of the same condiments. It has a lengthy finish and heavier on the tongue. Some find the Dijon more like a rounded nibble of a firm, green, young tomato with an accent of soft chile. It can initially be a bit hot on the tongue depending on the manufacturer. America versions are smoother, while the French brands are somewhat more floral. Usually, hot, bright, and smooth, making it a prevalent and vital ingredient in any cooking adventures. The differences in flavor are related to a ton of variables, which include the temperature and acidity of the liquid, the age of the mustard, and the type of seeds. We can say Dijon mustard is excellent if it is thick and bold, with a pinch of acid and salt, huge mustard flavor, and a wasabi horseradish, satisfying sort of heat that hangs back. Often, a good Dijon is made with water or wine plus vinegar. A bad Dijon mustard is over salted, has a bottled sweat-like smell, or contains a mouth-crumpling trace of vinegar that kills and overpowers the heat. When shopping for Dijon mustard, ensure it has the smallest amount of ingredients – only mustard seeds, vinegar, and water are necessary – though wine is also appreciated. It may not be impossible to avoid added sulfites and acids, make sure the mustard you intend to buy doesn't include lots of preservatives. Although Dijon is relatively available in any supermarkets, it is not always handy for many people. This is where making a homemade Dijon mustard comes very beneficial. Aside from saving your health from harmful additives, you are also allowing yourself to save more dollars in the end. Preparing one for your family or your guests is just easy. So, here's how to make one. In a small nonstick wok or saucepan, mix the garlic and onion. Pour the white wine. Put on medium-high heat and bring to boil. Simmer the heat when you notice the bubbles are starting to come robustly. Allow it to cook for five minutes uncovered. Turn off the heat and remove the solids. Reserve the broth in a clean pot. On a medium heat, pour back the broth to the pan. Add a small amount of mustard powder. Keep mixing with your other hand. Add honey and mix. Later, add the oil with salt. Mix and bring to boil. Once thicken, turn off the heat and transfer it to a bowl (a glass bowl will do). Keep the bowl on your kitchen counter for around three to four hours and then store. Tips: It is recommended not to boil the onion and garlic mixture and wine so the broth will not have a bitter taste. Also, do not boil the mustard paste for a more extended period, otherwise it will cause bitterness. Do not just settle for a single ingredient to use along with Dijon mustard! The good news is that there are other ways you can take advantage of the unique, pungent, and delicious taste of Dijon without breaking the bank. Here are Dijon mustard cooking ideas you can try! Dress salads: Dijon is said to be the best salad dressing essential next to vinegar and oil. Thanks to its completion and thickness, the vinegar and oil are integrated well plus the additional bit of heat is good on frisee, escarole, or other bitter greens. The next time you make a potato salad recipe, make sure to sprinkle some fresh herbs to impress your guests! Whip up honey mustard: An excellent alternative if you need something to dip some buttery chicken fingers, for example. Its balanced sweet to spicy taste is simply right! Sandwich spread: Another, if you want to make a two-ingredient sandwich spread, Dijon mustard can do the wonders. Soups: If squeezing some lemon or tipping a pinch of vinegar into your soup is not interesting anymore, why not add zing to the sauce by mixing some Dijon? However, start by a small quantity. Surely, you will not avoid this addition when making another bowl of soup again. Marinate: Pulverize some garlic, herbs, wine, and some Dijon mustard to make your marinate on the jazzier side. It will soak tougher meat slices such as flank steak or lamb leg. Make dijonnaise: Probably the best and easiest thing you can do for mayonnaise. All you need to do is prepare a bowl and two spoons and voila! Vinaigrette: When it comes to the vinaigrette, Dijon also acts as an emulsifier. Meaning to say, it helps the oil mix into the vinegar without splitting. If you're like me who have hooked with Dijon in vinaigrette, then you can try to mix it with yogurt and mayo for a salad dressing or as a sauce for steamed vegetables. Fish, pork, bread chicken, or ribs: If you want a crunchier and crispier coating for your fish, pork, ribs, or chicken, try sprinkling some Dijon mustard over a spice mix or breadcrumbs. 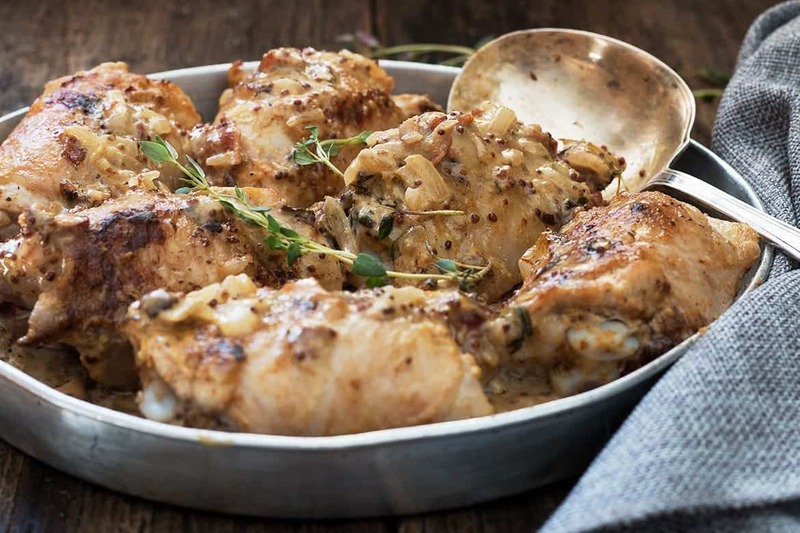 French mustard chicken: Learn what you can get when you combine buttery, Dijon mustard spiked sauce and chicken thighs. Definitely, one of the appetizing meals you will wish to have every day on your table! Mix into eggs: Eggs love Dijon, and you will also surely do if you try one of these days. Simply whip the Dijon mustard into the blend for quiche, casseroles, scrambled eggs, and frittitas, to give the eggs a fresh, more interesting light. Deviled eggs: If you want to give some oomph to your deviled eggs, now is your high chance! With a little mayo, maybe a scatter of salt and a few paprikas, and Dijon mustard, your deviled egg will have a milkier filling – making you more addictive to it. Glaze: When making a glaze for ham or other things, the Dijon mustard is such a scrumptious addition. Brown sugar dominates in pork and chicken, but it is propped up through the harmonizing acidity of Dijon mustard. Roasted potatoes: Dijon roasted potatoes, sounds appetizing? It sure is! This one is one of the favorite plain sides of some Dijon lovers, not to mention it is filled with a huge flavor punch. Mac and cheese: Heads up mac and cheese lovers, there is something you won't surely overlook trying out - combining Dijon with your mac and cheese! Experience the delicious upgrade your palate and tummy rightly deserves! Put in slaw: Revive your cold summer salad or boring coleslaw by whisking some Dijon mustard. It adds creaminess without having you to depend on dairy products. 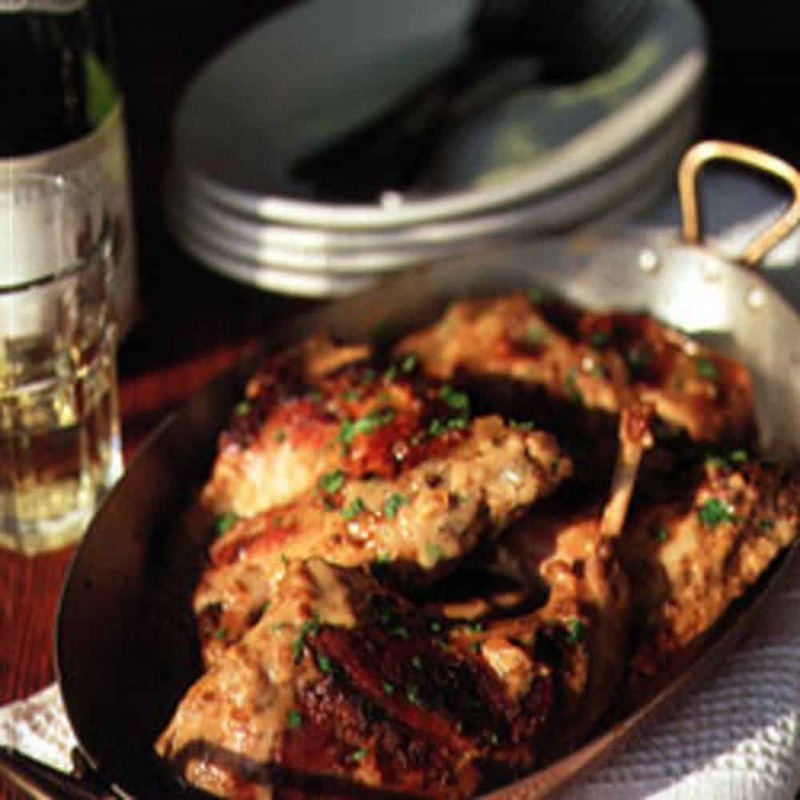 Pan sauce: Dijon also acts as an emulsifier in a pan sauce that begins with the sopping purified from cooking meat. From steak to chicken, the flavor it gives greatly pairs. Thus, you can enjoy a plate of your favorite food along with your set of friends or whole family. You can definitely enjoy the taste of the Dijon mustard through using it the right way on a certain recipe. And some options are already provided above! So, what does Dijon taste like? You have an idea about its taste through the information tackled above! Another important ingredient to any recipe, the Dijon mustard has long been used in the different parts of the world. It boasts a smooth, delicious, and quite hot taste, which makes it a unique ingredient – no wonder it has been called the king of mustard. Doing homemade Dijon mustard is just plain and simple, besides cost efficient. Plus, there are many other ways you can do to include this mustard in your cooking for a tastier finish. Hope you enjoyed reading the article! Like and share. Have questions in mind, or want to share some ideas, or ask some more questions? Feel free to do so through the comment section below. We'd love hearing from you!